IFA exhibitions in Stuttgart and Berlin: NID’s Bamboo Initiatives and Design from India on show in Germany. I will be discussing more about these Bamboo Initiatives on this blog in the days ahead and share how we have been using design as a vehicle to concretize our intentions of bringing development initiatives to communities and situations in India particularly for rural communities that are in need of some catalyst that can help them fend for themselves in a rapidly changing world that is increasingly globalised and in a manner that is both dignified and satisfying for them in many ways. That these aspects of design are not tangible in the exhibits is both a problem and a challenge for the design initiative and it would be appropriate for us to remember here that Germany is the home of both the Bauhaus (1919 – 1936) and the Hfg Ulm (1950 – 1968), both great design schools, nay great design movements, that showed the world the power and subtlety of design – from shaping form to structure, and from the creation of meaning and beyond – at one level a play of aesthetics and technology, at another economy and style and at yet another politics and philosophy and about the shaping and manifestations of a vision or intention – the shaping of culture itself. Lotus Design Services from New Delhi (Ambrish Arora, Sidhartha Talwar, Ankur Choksi and Arun Kullu). Their work and descriptions can be seen at the web links shown above. The National Institute of Design show of bamboo furniture is but one part of this larger show in the exhibition. Our products are shown below with a brief caption about the product as well as the context for which they were created. each of these projects helped create many new products as well as train numerous students and craftspersons in the field. These experiences will be reflected upon in future posts. 1. 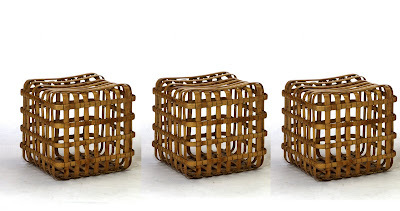 Cube Stool: Designed to be made through mechanized splitting at Common Facility Centres (CFC’s) and later hand fabricated in several small scale production units located in the surrounding villages of Northeast India. 2. 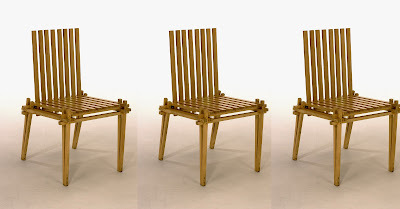 Laminated Chair: Designed as part of the Bamboo Boards and Beyond project as well as the Systems design class at NID it is part of a collection of products that were used to demonstrate the future potential of laminated bamboo as a timber substitute for India. Student designer: Mann Singh. Faculty Guide: M P Ranjan. Designers: G Upadhayay and M P Ranjan. 4. 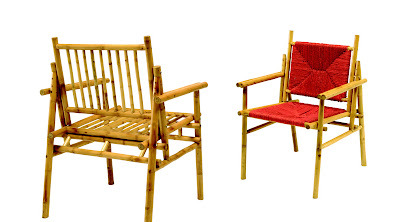 Katlamara String Chair and Arm Chair: Designed to be made using the simple joint that can be made using a drill machine and a saw as well as in a knock-down construction for easy transport to local and upcountry markets it is part of a strategy to build local entrepreneurship in a village that grows bamboo. Sponsors: DC (Handicrafts) Govt of India, Northeastern Council, Shillong and the CBTC, Guwahati. KaosPilot: A business school that teaches design? Are there lessons in this for India? The most exciting business school that teaches management using design principles – KaosPilot – has established itself over the past 14 years and it is now expanding to other locations in Scandinavia and the rest of the World. The first school was located in Aarhus Denmark, founded by the visionary and tireless Uffe Elbaek, and it has now been expanded to new programmes in Norway, Sweden and the Netherlands and plans are afoot to set up ‘outposts” in San Francisco and Durban, South Africa. What are the principles of their success and what are the lessons for India? KaosPilot teaches using the “Immersive Method”. The products from the school, its students – the KaosPilots – are Creative, Self aware and Disciplined and are ready to address the needs and challenges of the “Social Entrepreneurship Sector” in the words of the founder, which is the fourth sector that is achieving prominence when compared to the other three sectors namely the government supported public sector, the corporate and private sector and the not-for profit voluntary sectors, all of which aim to do good for their respective stake-holders, but have come in for intense criticism from a number of sources in recent times. The KaosPilot story is now well documented in the book available in English titled “KaosPilot A – Z” which can be obtained from their website as well as from Amazon. Further the KaosPilot website itself is full of information and insights from the project work done by the students over the years, all documented in the “Flight Navigator” a Journal produced regularly by the school available from this link below. Uffe Elbaek and the KaosPilots have discovered that design works best when used to address the needs of the ‘fourth sector’ – a new space where the boundaries between the Public sector (district, state and national), the Private sector (companies and corporations) and the Voluntary sector (the not-for-profit organizations) have blurred and become less distinct – and can now be dubbed the “new social arena” and the “for-benefit” sector, all in the public interest but managed in a professional and accountable manner by individuals, organizations, institutions and companies using the “triple bottom-line approach” to judge their performance. Organisations that are characterized by being self-financing as well as being social, ethical and environmental in their sense of responsibility and actions. The KaosPilot curriculum is therefore derived from the need to be entrepreneurial in orientation; located in an arena that lies between the disciplines of arts, culture and business; using the approaches of being playful, real-worldly and street-wise with risk-taking that is balanced and compassionate; all of which sets the aims and goals that are larger that the self – in a three year programme that is divided into basics, specialization and innovation years. Real situations and challenges are addressed by students working in teams and in live contact with stake-holders to develop empathy and reality contact that are rooted in the personal mastery of the unique competency model that is the hallmark of the KaosPilot programme. The five fold competency model includes Professional, Social, Change, Action and Sense-making competencies all integrated into their creative project and business design assignments. Yes, business design. They are in the field of designing new businesses and not just in managing business as the MBA’s do in their traditional programmes around the world. This is where design principles get integrated into the process of creating great managers, young entrepreneurs capable of building great new businesses that are located squarely in the ‘fourth sector ideology’ for a rapidly changing and increasingly transparent world order. Does India need this kind of shift – from managing to designing – looking at design opportunities rather than at problems and problem-solving, kindling a new mind-set and a new capability to bring imagination into our actions across the various sectors and regions? I am convinced that it does. Somehow for me the efforts of the KaosPilots in distant Denmark echoes the ethos and values that NID has been advocating and applying inside our own curriculum and project based education programmes over the past forty years. 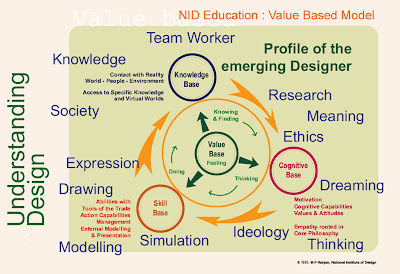 The value systems that have been cherished and the work culture that had been instilled in our NID undergraduate programmes during the past four decades too need to be examined and discussed in detail in the manner in which the KaosPilot story has been articulated in the Kaospilot A-Z book. We may need to move as a nation from – specification following tendering process – with the why-reinvent-the-wheel-attitude of our administration, to an innovation-driven and opportunity-seeking government action in the enormous area of social and public design action that could be supported by the huge investments taking place in the 230 sectors of our economy today that are in desperately in need of design. All this can be facilitated by our new National Design Policy and be made into a reality for our people. This is perhaps what we can take away from the KaosPilot story, how it can perhaps be done by trained “design managers” and not just by designers alone. What do you think? Are our management schools listening? The most exciting business school that teaches management using design principles – KaosPilot – has established itself over the past 14 years and it is now expanding to other locations in Scandinavia and the rest of the World. The first school was located in Aarhus Denmark, founded by the visionary Uffe Elbaek, and it has now been expanded to new programmes in Norway, Sweden and the Netherlands and plans are afoot to set up ‘outposts” in San Francisco and Durban, South Africa. What are the principles of their success and what are the lessons for India? The KaosPilot curriculum is therefore derived from the need to be entrepreneurial in orientation; located in an arena that lies between the disciplines of arts, culture and business; using the approaches of being playful, real-worldly and street-wise with risk taking that is balanced and compassionate; al of which sets the aims and goals that are larger that the self – in a three year programme that is divided into basics, specialization and innovation years. Real situations and challenges are addressed by students working in teams to develop empathy and reality contact that are rooted in the personal mastery of the unique competency model that is the hallmark of the KaosPilot programme. The five fold competency model includes Professional, Social, Change, Action and Sense-making competencies all integrated into their creative project and business design assignments. Yes, business design. They are in the field of designing new businesses and not just in managing business as the MBA’s do in their traditional programmes around the world. This is where design principles get integrated into the process of creating great managers, young entrepreneurs capable of building great new businesses that are located squarely in the ‘fourth sector ideology’ for a rapidly changing and increasingly transparent world order. Model of the Emerging Designer. Does India need this kind of shift – from managing to designing – looking at design opportunities rather than at problems, kindling a new mind-set and a new capability to bring imagination into our actions across the various sectors and regions? I am convinced that it does. Somehow for me the efforts of the KaosPilots in distant Denmark echoes the ethos and values that NID has been advocating and applying inside our own curriculum and project based education programmes over the past forty years. The value systems that have been cherished and the work culture that had been instilled in our NID undergraduate programmes during the past four decades too need to be examined and discussed in detail in the manner in which the KaosPilot story has been articulated in the Kaospilot A-Z book. We may need to move as a nation from – specification following tendering process – with the why-reinvent-the-wheel-attitude of our administration, to an innovation-driven and opportunity-seeking government action in the enormous area of social and public design action that could be supported by the huge investments taking place in the 230 sectors of our economy today that are in desperately in need of design. All this can be facilitated by our new National Design Policy and be made into a reality for our people. This is perhaps what we can take away from the KaosPilot story, how it can perhaps be done by trained “design managers” and not just by designers alone. What do you think? Are our management schools listening? The pdf file of my presentation to the teachers can be downloaded from my website link here. So what is this “Design” that Kiran and her team are managing to put inside education at Riverside and is this something that can be extended to more levels of education across India. Last year I asked this question along with my teaching colleagues at NID when we set the theme of the “Design Concepts and Concerns” (DCC) course for the Foundation programme students at NID. The course that is now called DCC was previously labeled Design Process (DP), Design Methods or Design Methodology (DM) in the past having been borrowed from international traditions of Bauhaus and Hfg Ulm as well as the RCA driven movement in the UK in the 60’s but I changed the name after teaching it for many years when we realised at NID that design was not just about concepts and skills and techniques but it was also about feeling and values which were at the heart of all the thought and action, irrespective of the discipline and the field of enquiry. In this DCC2007 we chose the theme of “Design inside Education” and assigned five batches of students areas of focus that included “Pre-school education in India”, “Primary education in India in the Rural and Urban sectors” respectively and the other two groups looked at issues and perspectives that would influence the “Education of youth in India”, all based on their own fairly recent immersion in the Indian school system from their personal journey through it. Students were taken through a series of assignments that I have outlined in my paper titled “The Avalanche Effect”, which can be downloaded from my website and these assignments took them through the DCC course from articulating and visualizing their personal experiences, their collective experiences by brainstorming, followed by model building to understand the structure and content of the educational system as it applied to each of the focus areas that were assigned to each of the five groups. 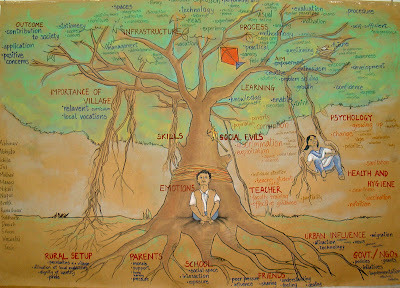 The first assignment had them sharing with us their school experiences which revealed both the pleasures and the traumas of school systems in India as scenario visualizations, some elevating and others shocking by the expressions that were shared in the class. During the class we all made a trip to Riverside last year and our design foundation students were both surprised and excited by the fluency with which the little kids from Riverside took them through the school and explained its working methods and teaching content and style, all with a great deal of confidence and pride. The DCC class of 2007 that set about exploring, researching and imagining alternate scenarios that could help them build models and identify design opportunities across each of the school educations sectors that had been assigned. The models suggested deep understanding and empathy and these led to each group exploring numerous design scenarios that could transform the education sectors in India by addressing imaginative and innovative alternatives for infrastructure, products, procedures, services and communications opportunities in each of their groups assigned projects. This five week assignment was for the student a journey through the design landscape from the macro and the micro perspectives which is in keeping with our design philosophy of macro-micro design action from policy to the very minute details, all of which have to be in perfect fit and balance if the design is to be truly successful as a whole and not to be seen as fragmented parts. Education is just one of the 230 sectors in which design can be used at the macro-micro levels of action and I do hope that we see it being used more in India in then days ahead. Other themes in the past for this DCC course have been macro issues such as “Impact of Globalisation” (2004), “Khadi as an Ideology for Design” (2003), Retail as an Emegring Experience (2001), pictures of which can be seen at my website from this link below. 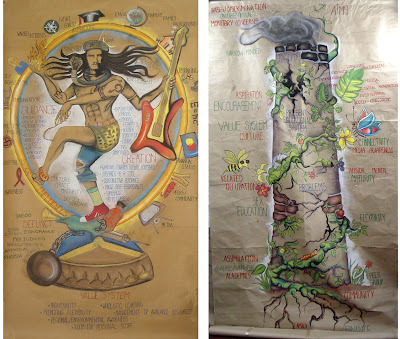 Others which are not yet on the site include “Creative Industries of the Future” (2004), “Six Design Institutes for Six Regions of India” (2005), “Response to the National Design Policy for India” (2006), “Design inside Education for India” (2007) – each year we took a new theme and this went back many years, but are still to be documented, hopefully soon on this blog. For instance “Home Office and New Services” was the topic for the 1996 batch of foundation students which was particularly memorable, but others will also be reflected upon and discussed in the days ahead. While reflecting on a question, by Shimolee Nahar a young graduate product designer from NID and a member on the designIndia list, I made these suggestions for research and action in India. One question that came to my mind was – What are Indian designers doing today which is interesting and useful for the long term happiness of our planet? It would be good to have these documented and brought into sharp focus in all our design schools and also to see it percolating into the consciousness of all our professionals as a viable and exciting entrepreneurial option to a lucrative desk job within industry. Global warming is now a popular fad. I had seen the Time magazine cover story on Global Warming as well as "What can we do about it" story that was included in that issue. You can see the story now online at the following links. “What you can do" story at their website. Also recommended is Al Gore's documentary film, "An Inconvenient Truth", on Global Warming and the YouTube commentaries that follow it in a lighter vein. India Today magazine, which is delivered to my home every week, too followed up with a me-too story in the weeks that followed, but unfortunately their website is a subscriber only site, they still seem to be living in a Web 1.0 mindset with a closed access regime, I wonder when they will change.!! and adopt a Web 2.0 mindset.....of open access, interactive and user driven content....I hope soon. You can access the full story if you have a subscriber number from the cover of their mailing envelope. Yes, each of us needs to ask the question, "What can we do?" and as a group of designers the topic is of great relevance. The world is changing and the – DesignIndia forum – and platforms like this one can be used to share what we are doing in our individual and professional capacities and it may be good to have this all documented and shared with the policy makers in India as well as with each other. This will bring a mind-set change which we do need if we are to succeed in our efforts in the days ahead. For instance Dinesh Sharma, an industrial design graduate from NID, is working as design consultant to an enterprise called “Furaat Rainwater Conservation” and he has created his patented design and technology for offering both new as well as retrofitted rainwater harvesting systems for homes and organisations in Ahmedabad which not many people that I met are aware of just now. Calls are already coming in for this application from Tamilnadu and Karnataka which are currently battling over the Cauvery water sharing dispute and I am sure that more will follow as the value that it provides seeps into our collective consciousness. You can see the work of Furaat at their website link on the left hand panel here. There is the wonderfully insightful and significant initiative from Poonam Bir Kasturi in Bangalore and it is now expanding to Chennai through her "Daily Dump" domestic organic waste management system which can be seen at this link here. You too can act now and get the – Daily Dump – installed in your own home as a demonstration and test proving site. “Daily Dump – compost at home (India) Designed by Poonam Bir Kasturi. Challenge: 70% of waste generated in urban homes in India is wet organic waste, which before was collected and composted. However, after having discovered that public-sector waste disposal service does not sort the waste, citizens have lost confidence in using it. We do look forward to this design contribution from India getting global recognition that it deserves, great going Poonam. See also this World Changing link here. There are many many more that we do not know about since the design media is unfortunately only interested in glamour and glitz, it seems. We need to change that. On these forums (DesignIndia list, Design with India, and Design for India, and others) we can help document all such initiatives and these could be showcased at the forthcoming CII-NID Design Summit 2007 so that some awareness and follow-up action can be catalysed in India using the design thinking that has gone into each of these cases. What do you think? Anyone who knows of any interesting and significant action in India or even small local initiatives of the use of design for such development and conservation intentions do send them in and I offer to collate all these into a collected research and share it with the interested people in the weeks ahead. If these are papers and web links that need to be explored these too can sent to me directly. It is indeed time that we collaborate as a design community on this task and make a joint submission to government and industry so that the funds required for sustained research and exploration in such social and ecological sectors can be initiated and sustained. Others interested can join us in this effort. What do you think? This is just one of the 230 sectors in which much work needs to be done, and the time is now, particularly at a time when the Government has come forward and set up a National Design Policy and we must help in giving shape to the actions and value that can unfold from this progressive move. We have been giving an assignment to our students in the "Design Concepts and Concerns" course since 1999 at the National Institute of Design, Ahmedabad that requires them to brainstorm and build a model of the Indian economy from the point of view of design opportunities that are embedded therein. The very fact that they address these broad perspectives in their foundation programme we feel that it would influence their career choices as the go forward in their education at NID and in their professional lives. These sectors are a mixed bag of industry types and service sectors where design is being used in India and these fall under several ministries of the Government of India. Our list is actually longer than 230 in number but the figure is not an absolute one, give or take a few. However when we had built models of the sectors in the classroom, one of the groups had a logic for the number “230” by virtue of their categorisation effort and this figure has stuck in all my references ever since. These are shown in the diagrams shown here in low resolution in order to appreciate how we did this exercise and arrived at the list of categories for Design action in the Indian economy. I had included this description in an invited paper that was prepared for the Design Issues Journal (the special issue on India that has been released last year) but unfortunately my paper was turned down for lack of space. My paper was titled "Avalanche Effect.." (October 2002) and it was based on my course at NID and I had immediately released it on the PhD-Design list and one can search for "Avalanche Effect" there. or download the paper from my website here. This image is a map of the sectors using a city as a metaphor and the streets represent the ministries and sectors while the title is a call for a Ministry of Design, how insightful. I do intent to take this further and make a full paper (when time permits) with a projection of the kinds of institutions that we will need to build in order to service this enormous task in India (and elsewhere) in the years ahead. I have already been involved in the design and establishment of three “schools of design" that address different sectors of the economy and this way we can find funding from different ministries and industry groups to make this happen as we go forward. The IICD, Jaipur is a school for the crafts sector in India, the BCDI, Agartala is a school for the bamboo sector in India and the Accessory Design Department at NIFT, New Delhi – for which I was an advisor – is a school for the jewelry, lifestyle & clothing accessory sector in India, we need many more such design initiatives. We still need to find the core of design capabilities that need to be at the centre of all these plans. We have reports on these initiatives that were prepared over the past ten years or more and these can directly download from my personal website link here. We would explore this further as we go forward and in my view design still needs to be understood in the context of all this complexity in that days ahead. As you will see, this is not a fully developed theory as yet but it is something that we can work with towards a better understanding of design and to see its impact at the macro-economic level. I have placed a new model using my Hyderabad keynote to the HCI-USID 2007 conference last month on my post below and one can download this model of design opportunities and the brief list of design disciplines, design sensibilities and design knowledge which need to be part of any new school of design in the years ahead. I believe that besides designers we will need to open the field to managers and other specialists to use the discipline of design and this will be the general challenge in the days ahead. Bruce Nussbaum talks about the need to get CEO’s to adopt design thinking as a way of life in his recent blog post on BusinessWeek Online which is very heartening to hear from a management perspective. He is echoing the views of people like Roger Martin of Rotmans in Toronto and Uffe Ulbaek of the Kaos Pilot, Denmark as well as other thinkers such as G K Van Patter of NextD, New York who is advocating the shift to Design 2.0, a new collaborative space that addresses complex problems rather than specialization bound frames of thought and work. I am currently interacting with a team of international experts on developing this list further and Dr. Ken Friedman, Denmark, Dr. Terence Love, Lancaster, UK, and Filippo A. Salustri, Toronto, Canada are cooperating online through the PhD-Design list as a team who are trying to take this forward as a well developed framework over the next few months of online collaboration. We will share the outcomes in public as soon as we are ready with our conceptual structure. See also ...What is Design? Design opportunities need to be mapped across all 230 sectors of our economy and in a recent lecture at Hyderabad (see below) I had used a five fold opportunity matrix to set out one possible view of this indicative set. These included, at the macro level five terms that helped capture the field of possibilities in an easily comprehendible model that went from the marco to the micro levels of human activities on the planet and this would be useful for India at the policy level as well. 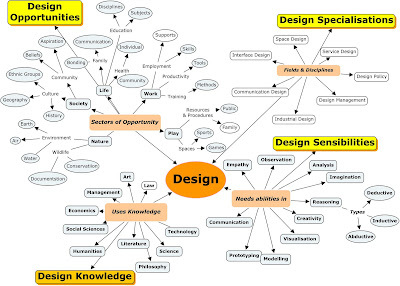 These design opportunities would need the designer to be empowered with knowledge sets from across a variety of fields as well as imbued with capabilities and sensibilities that can be used at the various stages of the design process, from goal setting and opportunity seeking, exploration and concept formation, scenario building and evaluation, business models and prototyping followed by detailed development, engineering and market delivery, all of which are critical and important if the innovation is to succeed in the particular context that it is to be developed in, particularly for India. These design sensibilities can be transmitted through good education models that can be adopted to reach across many disciplines and fields of expertise and these could be offered in multi-disciplinary frames at the university level as well at the school level so that design thinking and action become a natural capability of our society and not just be left in the hands of specialised designers who are today being trained in several selected specialisations within design schools. This would be a valuable way forward to build a creative society which can support a future economy that competes on innovation and knowledge applied in new and interesting ways that are both sustainable and exciting to generate great value in the near future. Find out more....: What are Design Opportunities?